A detailed evaluation of contenders for the best kids electric toothbrush left just two models standing at the top of a crowded field. In this report, you’ll hear about our picks for best kids electric toothbrush, as well as brief reviews of the reasons why you should consider them for your child. If you have kids from 3 years and up, you’ll want to read about the best kids electric toothbrush models before making a buying decision. Click the links and order either of them. Job done! However, if you’re more curious and want to learn everything about these shortlisted picks, read the rest of this detailed review and you’ll understand why these two are the best kids electric toothbrush choices. Philips Sonicare understands what little kids want in an electric toothbrush. And if this lovely creation doesn’t get your toddler or youngster eager and excited about brushing his/her teeth, then nothing probably will! The Philips Sonicare for Kids has every feature a parent might desire for kids. 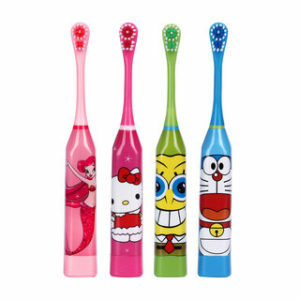 It comes in a range of colorful models, and also has stickers that help children personalize their toothbrushes easily. Just peel off the backing and stick it to the brush handle. In design, the Sonicare for kids is slender and fits comfortably into little hands. There’s a well-designed grip to keep the toothbrush from slipping out of the hand. A built-in timer which shuts down the brush automatically after two minutes makes the cleaning process more fun and ensures that a child will continue to brush for the required amount of time. 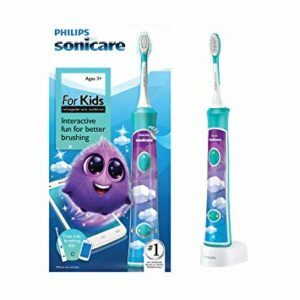 Bluetooth connectivity links the Philips Sonicare Kids Electric Toothbrush to a smartphone app that’s compatible with both Android and iOS devices. This transfers and stores brushing data, displaying it in an attractive way that motivates and encourages kids. Battery life is great, and you won’t have to worry about running out of charge too quickly. And there are several other innovations that make this the best Sonicare toothbrush for children and are specially helpful in guiding young users to becoming familiar with an electric toothbrush. For example, the Easy Start mode for newbies starts out with a low power setting in the first few days, gradually ramping up to full power over one or two weeks. The package comes with 2 spare brush heads, one each of Compact and Standard sizes, which makes the Sonicare for kids usable by younger and older children alike. The heads of the kids electric toothbrush are backed by rubber so that it feels soft inside the child’s cheek. If there’s a drawback to the Sonicare kids electric toothbrush, it’s only the slightly higher price. But considering all the features and convenience it offers kids, this electric toothbrush is a top pick for anyone shopping for a 3 years and up child. You’ll find a more detailed Philips Sonicare for kids review here. 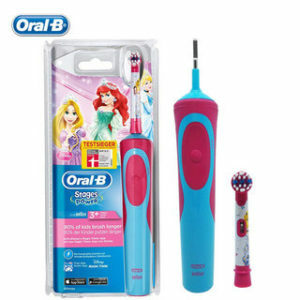 The other popular kids electric toothbrush is Oral B’s junior model which is designed for older children. It is classical, and has many features also seen in adult electric toothbrushes. You can choose between two colorful options, but there isn’t an app or Bluetooth connectivity like the Sonicare for kids. As a result of this, many kids find the Oral B slightly less engaging and fun. The brush head is adult sized, making it harder for smaller children under age 6 to use. But the Sensitive brush head has softer bristles that won’t hurt even more fragile gums and teeth. Battery life is good, with a full recharge lasting 7 days or more. There is a built in timer with Quadpacer, which helps focus a child’s attention on brushing for at least two minutes and dividing this attention equally to all four quadrants. Overall, the Oral B Junior Kids electric toothbrush is a fair alternative option to the Philips Sonicare for kids. You’ll find a more detailed Oral B Junior Kids electric toothbrush review here. Many parents have a valid question: Do kids really need an electric toothbrush? So let’s address that right away. Kids – just like adults – may not ‘need’ an electric toothbrush. But there are certainly several benefits to using a kids electric toothbrush. The cleaning power of an electric toothbrush, which is powered by a motor and uses sonic or oscillatory/vibratory energy to clean teeth, can do a much better job than a manual toothbrush. Whether it is removal of plaque, or clearing food debris between teeth, or massaging gums to improve blood flow, a kids electric toothbrush can do better than a child using a manual technique. Brushing your teeth requires correct technique. Learning to do a good job of it using a manual toothbrush takes a bit of learning and practice, not to mention dexterity and patience… all of which are hard for a child to follow. In fact, many dentists recommend that parents brush a child’s teeth until the age when she is able to tie her own shoelaces! That would mean taking responsibility for a child’s oral hygiene almost for 8 years. Unless you use an electric toothbrush, which is less dependent upon technique for cleaning efficiency. The motor powered battery-operated toothbrush does the hard work. Your kids will have cleaner teeth with an electric toothbrush than if they brushed on their own, or even if you helped them do it. Kids electric toothbrushes that have inbuilt timers can help ensure that your child brushes for the required 2 minutes. At their age, even a few seconds can seem like a lifetime, making it a challenge to convince kids to brush for long enough. Also, while using a manual toothbrush, a child is more likely to stop or slow down after a minute because their arms ache. By removing any physical labor and keeping track of time through a timer (which even indicates when it is time to shift to another part of the mouth), it’s easier for a child to acquire the discipline to clean teeth for two full minutes. And because dentists recommend this duration because of the benefits of clean teeth and improved oral hygiene, the discipline that an electric toothbrush forces upon a child pays off by way of better dental health. A key benefit of a kids electric toothbrush is that it makes cleaning your teeth fun and engaging. Models with Bluetooth connectivity with a smartphone app come with the kind of interactivity and progress tracking that appeals to youngsters, with the result that they enjoy the act of cleaning their teeth. Interfaces of these dental smartphone apps are designed to attract school going kids, making the task of brushing more fun and even educational. Two minutes no longer appears “too long” when they are enjoying the process. And watching as their achievements pile on in the archived records can be great motivation to keep them going on. There have been several studies conducted on the role of electric toothbrushes and engagement devices like a smart app in increasing the duration of kids brushing their teeth. And in an era where tooth decay is a growing problem with young children, thanks to the increasing intake of sugar and changing lifestyle choices, anything that helps prevent dental caries or gum infections is welcome. Taking good care of a child’s teeth is a great way to beat gum disease, plaque build up and cavities that might lead to tooth extraction. Developing good oral hygiene habits in a child can forestall future dental problems and expensive treatments. In all these ways, a kids electric toothbrush can make a big difference. Should You Choose a Kids Electric Toothbrush by Age? Parents, like regular consumers, often trust brands that have served them well – and look to their suggestions about the appropriate electric toothbrush for their kids age group. But although many brands do categorize their models by age group served, it sometimes isn’t easy to decide upon the best options. Different models of kids electric toothbrushes vary by power settings, brush heads, designs and ease of use. And accordingly, only a few models will suit children of a particular age. Some manufacturers get more granular than this with their suggestions. Oral-B lists 4 distinct categories on their website, breaking up their kids electric toothbrush devices by age into ones best suited for 4 to 24 months, 2 to 4 years, 5 to 7 years, and 8 to 12 years. Generally, a child older than 3 years can comfortably use a kids electric toothbrush. But as they grow older, you should consider accessories like brush heads that are appropriate for their age and size. Also, not every child grows up at the same speed. So your choice must be guided by their level of development rather than strictly by a number. And once children reach age 12, you might consider giving them the broader choice that comes from an adult electric toothbrush. 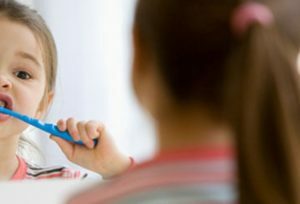 Should a Child’s Brushing be Supervised or Independent? Once again, this will depend upon your child’s age and development. Some children need more assistance for a longer time. Others will learn faster and be just fine when left alone. Children under 4 years of age usually require a caretaker to help clean their teeth. The child can have a go at it, but will often need some assistance and finishing up. Brushing teeth requires coordinated hand movements, and the skills don’t develop rapidly or smoothly. It may take a bit of practice to perfect one’s brushing technique. During this period, patience and guidance are the key. Beyond age 6 or 7, most kids will get the knack of brushing independently. You might only need to occasionally monitor their technique and discipline, tweak any flaws and ensure that they stick with it for long enough to achieve good oral hygiene. A quick inspection of their teeth periodically will help give a clue about how effective their efforts are. With a kids electric toothbrush, the monitoring process is made easier as bluetooth connected devices track brushing activity and record them on a smartphone app for later review. Whenever you notice a drop in efficiency, it’s time to step in and supervise. Can Kids Share an Electric Toothbrush? Yes, it is possible and convenient for kids to share an electric toothbrush, as long as you change the brush head in between uses. This may not be easy for a young child to do, so be prepared to change brush heads for the child using the toothbrush. Battery life is also going to dwindle when there are multiple users. The estimated recharge time of 1 week is based on a typical usage of 2 minutes per session, twice in a day. When two kids use the same electric toothbrush, the number of minutes per week doubles – which means you’ll have to charge your toothbrush twice in a week. The electric toothbrush models with apps will usually have the ability to set up separate profiles for each users. So as long as you remember to switch profiles before brushing, there’s no reason why each child cannot have separate displays tracking their individual performance. Indeed there may be scope to have friendly competition between the kids for brushing efficiency. Another potential problem for parents whose kids share the same electric toothbrush might be fights over which color, sticker and design to get. Personalization could become a contentious issue, and in that case it might be easier on your peace of mind to simply get each child a separate brush. Can Kids Use An Adult Electric Toothbrush? While it is possible on principle for a child to use adult electric toothbrushes, they won’t enjoy the advantages that go into the specific design of kids electric toothbrushes. Adult brushes often have more powerful motors and are more aggressive in brushing. Younger kids may not find this pleasant. Beyond the age of 8 to 10 years , a child’s mouth, gums and teeth are almost the same size as an adult. They can usually accommodate an adult toothbrush at this point without too much difficulty. It might be a little uncomfortable brushing with a larger brush head, especially when cleaning behind the last molar teeth. The bristles on an adult electric toothbrush are a bigger problem. They are stiff and hard, being more likely to injure delicate gums and sensitive teeth in young users. But there’s a simple solution – to use a replaceable brush head of the Sensitive range which has softer bristles and is specially designed to be less stressful on teeth and gums. Where To Buy a Kids Electric Toothbrush? There are several options to purchasing an electric toothbrush for your children. Offline retail outlets like Boots, Target, Argos, Safeway, Walmart and other supermarket chains often stock these models. Online ecommerce portals like Amazon will usually give you lower rates thanks to frequent deals and discount offers. And of course, you can also order directly from a manufacturer’s website . It isn’t easy to pick a child’s electric toothbrush. There are several features and options to consider before you zero in on your ideal choice. And it’s easy to get overwhelmed by too much data and information. Hopefully this brief overview has helped you understand the broad principles behind selecting an electric toothbrush for your child. You might also find the Buyer’s Guide to the Best Electric Toothbrush helpful in understanding more about how to pick your ideal brush. While you don’t have to go overboard to buy the most expensive kids electric toothbrush with all the bells and whistles, it may well be worth the price just to establish a disciplined and systematic approach to maintaining oral hygiene in young children at an early age. If you have any further doubts or questions, please leave a comment below.